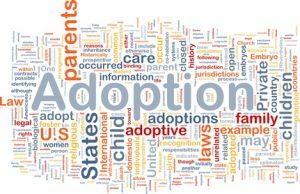 In decades’ past, all adoptions were closed adoptions – a closed adoption means that no contact occurs between the child and his or her birth parents once the adoption has been finalized and, in some cases, before the adoption of the child has formally taken place. Recently, however, adoptions have trended more toward “open adoptions,” which means that the child, the birth parents, and the adoptive parents meet and often remain a part of one another’s lives even when the adoption has been formally finalized. Closed adoptions have become rarer in the U.S., but they are common with international adoptions. During the closed adoption process, prospective adoptive parents add their names to a list and wait for someone from social services to contact them with a potential match for a child. The adoptive parents in this process do not know where the child comes from or who his or her birth parents are, and the child often does not know he or she was adopted unless the adoptive parents divulge this information. In cases where the adoptive and birth parents do not keep contract during the adoption process, they do not remain in contact. Open adoptions have become increasingly more popular in recent years. In this process, the birth parents and the adoptive parents meet and then usually stay in touch after the adoption has been finalized. Modern adoption agencies are now encouraging some form of openness with adoptions, and birth parents often have a voice when it comes to choosing the adoptive parents for their child. The most common practice is for the adoption agency to provide the birth parents with information and biographies of potential adoptive parents for the birth parents to choose from, so they can select a family they are comfortable adopting their child. In the open adoption process, the adoptive parents meet and communicate with the birth parents during the pregnancy, and many adoptive parents have the chance to witness the birth of the child as well. Some adoptive and birth parents choose to stay in touch through the adoption agency as the child grows, especially around the child’s birthday or important holidays, and other adoptive and birth parents choose to stay in touch on their own and often become friends, both being involved in the child’s life. The specific situation of the adoption often dictates the amount and type of contact. Andrew has a strong understanding with family law matters including Divorce, Child Custody, Child Support, Visitation, and Father's Rights.